Daredevil is a fictional character in the Marvel universe. The devil of Hell’s Kitchen. Is he good or is he bad? It all depends on your perspective. He is definitely the most badass lawyer of all time. First played by Ben Affleck the character and series was perfected by Netflix. Will Ben have green lantern moment in a future movie like deadpool. To complete a costume trio you need a Karen Page and Foggy Nelson. Through the Netflix Daredevil show, Matt takes on many different costumes. Matt wears the Daredevil fighting outfit and later after everyone thinks he’s dead, he schemes to kill Wilson Fisk. He’s in a black outfit with ropes tied around his arms. Click here to find more Daredevil costume ideas. 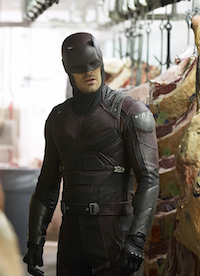 Find Matt Murdock Daredevil costume ideas below. 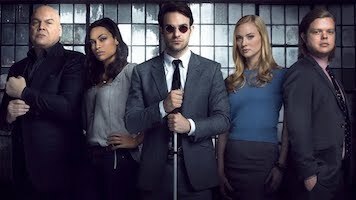 Matt Murdock is blind and uses a cane but doesn’t really need one. He can hear everything. 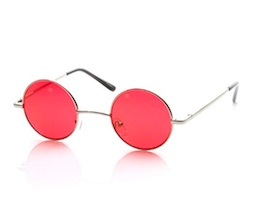 Matt Murdock eye glasses that he uses when he pretends that he’s blind. Click here to get Matt Murdock glasses. This is the professional cosplay costume to look like Daredevil. This is a costume if you want to look like him. 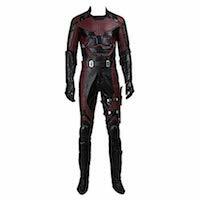 Click here to get Cosplay Deluxe Daredevil Costume for Adults. 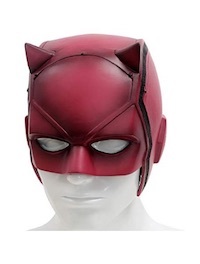 Look like Matt when you wear this Daredevil mask. This jacket is made with high quality Grade A Synthetic Leather with double stitching for durability. 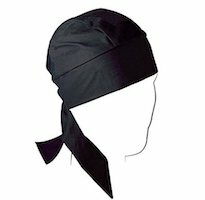 It features mock collar for sleek styling. 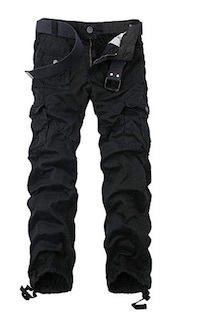 It also features shoulder tabs, 2 outside and 2 inside pockets and a satin + polyester lining. 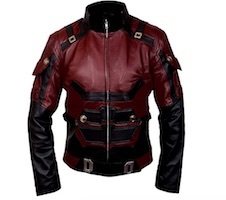 Click here to get the Daredevil Costume Jacket. In Season 2 Matt used the black mask to cover his eyes. Click here to get Matt Murdock Daredevil Black Mask. Daredevil mostly wore a black shirt and a black mask when he was Daredevil. Dexter was dressing up as the evil Daredevil. He couldn’t wear the same costume as well. 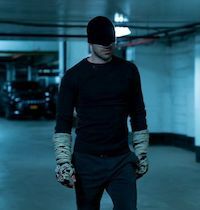 Daredevil wore a totally black outfit including black pants, black shirt and black mask. Click here to get Daredevil Costume Pants. Daredevil used ropes to protect his arms when he fought. 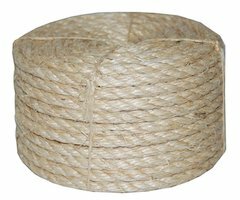 Click here to get Daredevil Ropes.